I’ve recently been experimenting with Data Visualisation in R. As part of that I’ve put together a little bit of (probably error ridden and redundant) code to help mapping of Australia. 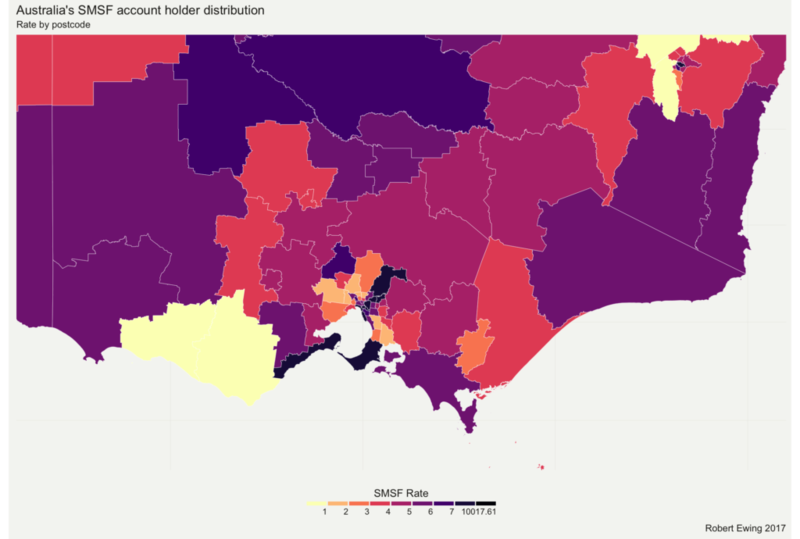 First, my code is built on a foundation from Luke’s guide to building maps of Australia in R, and this guide to making pretty maps in R.
The problem is that a lot of datasets, particularly administrative ones, come with postcode as the only geographic information. And postcodes aren’t a very useful geographic structure – there’s no defined aggregation structure, they’re inconsistent in size, and heavily dependent on history. Way too messy to be useful. The ABS has a nice set of statistical geography that will let me fix this problem by changing the aggregation level, but first I need to convert the data into another file. ## Read in original data file, clean as needed. ## and a data series called 'smsf' for the numbers. ## Change this line depending on your data series. ## you'll need to change the Aggregate functions. ## And produce the SA2_2011 version of the dataset. Data is in x. ## and finally join the SA2 with the rest of the hierarchy to allow on the fly adjustment. This entry was posted on Thursday, January 5th, 2017 at 3:26 pm	and is filed under Economics.